Working with historian Jay Fenton, VCI Entertainment has resurrected two rare film noirs from the 1940s, which most certainly would have disintegrated very soon. Even in spite of the technicians' hard work, the films still suffer from severe sound degradation and a fuzzy picture. Still both films are highly recommended. Bury Me Dead (1947) opens with the intriguing premise of a woman (June Lockhart) attending her own funeral, and subsequently wondering who is really buried in her grave, how they got there and who the murderer was. The rest of the film is comprised of strangely comic flashbacks as the woman works her way through the likely suspects. Director Bernard Vorhaus effectively integrates these bits of clowning into the story without killing the suspense or the terror. He also keeps the lid on a very tight cast, including future TV star Hugh Beaumont ("Leave It to Beaver") and the once blacklisted Cathy O'Donnell, who had given an acclaimed performance in The Best Years of Our Lives. The film is blessed with cinematography by the great John Alton, who cut his teeth on low budget, black-and-white noirs like this one before going on to full color extravaganzas like An American in Paris (1951). Alton perfected a very stark, cheap way of lighting that involved only a few very bright lights, which resulted in severe contrast between inky blacks and luminous whites, with very little gray area. His work lends an air of desperation that definitely helps Bury Me Dead from sliding off into farce. Based on a Cornell Woolrich novel, The Chase (1946) begins with standard noir elements: a down on his luck man takes a job with a gangster type, falls in with a dangerous femme fatale and puts his life on the line for her. The film preys on Americans' post-war fears and insecurities with its main character, Chuck Scott (Robert Cummings). When we first meet Chuck as a former Navy man, he's out of work and staring hungrily through a coffee shop window at sizzling bacon and eggs. He finds a wallet, belonging to the rich, crooked Eddie Roman (Steve Cochran). He takes out just enough for breakfast, then returns it, and is offered a job as chauffer in appreciation for his honesty. He meets and falls for Eddie's girl, the mysterious Lorna (Michele Morgan), who asks him to help her escape to Cuba. He does and he's immediately blamed for a murder he didn't commit. Written by Philip Yordan (Johnny Guitar) and directed by Arthur Ripley (Thunder Road), the film has two strange angles. First, very few noirs were effectively set in warm, exotic climates, but Ripley makes the most of the Havana sets. Second, the film turns on a bizarre dream sequence that suddenly wrenches any expected ending away from the viewer. It's a little disconcerting, and some viewers may be irritated. Despite all this, The Chase is very much seeing for one reason: Peter Lorre steals the film as Eddie's deadpan sidekick. 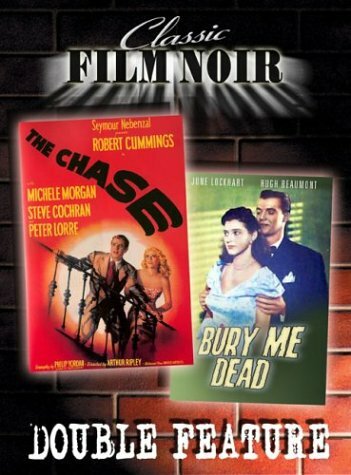 DVD Details: The DVD's ample extras include one of the great Max Fleischer Superman cartoons, Showdown (1942), a 26-minute short film, Death by Proxy, that seems to have been edited down from Bury Me Dead, bios and filmographies for Robert Cummings, Peter Lorre, June Lockhart and Hugh Beaumont, film noir "trailers" (for Allan Dwan's Slightly Scarlet, Anthony Mann's T-Men and Raw Deal, The Scar, The Limping Man, Impact, D.O.A. and Blonde Ice) and a film noir movie poster gallery. Film noir expert and restoration advisor Jay Fenton provides liner notes and commentary tracks for both films.